1. Introduction: Learn to Fish / Who should read this book? / What is in this book? / What is not in this book? 2. BackgammonBasic Checker Strategies: General Strategy / Points and Positioning / Moving Checkers / Racing Strategy / End Game and Bearing Off. 3. BackgammonWinning Game Strategies: Overview / Running Game. Prime Game / Holding Game / Blitz Game / Back Game / Vision and Flexibility. 4. Learning Some Probability: Quiz / Direct Shots / Dice Probabilities, 6x6 Grid / Special Case of Doubles / Indirect Shorts. 5. Learning to Estimate (Who's Ahead? ): Eyeballing the Board / Counting Crossovers / Other Pip Count Methods. 7. More Tips & Strategy Lessons: Think of Game Plan / Hit-Hop / Protect your man with a buddy (6 pips away) / Don't Fear the Two-Man Point / Hit Two Men / Points in Home Board / Controlled AggressionRisk/Reward / Getting Your Runner(s) Home Safely / Bearing Off with Contact / Least Bad. 8. Doubling CubeThe Great Equalizer: How does the Doubling Cube Work? / The Rule of 25% / Access to the Cube = Weapon / Be More Aggressive with the Cube. More Aggressive with the Cube versus Better Players / Less Aggressive with the Cube versus Weaker Players / Gammon Threats and the Doubling Cube / Think of the Cube and the Match Score / More Wisdom on the Doubling Cube / Importance of the Doubling Cube. 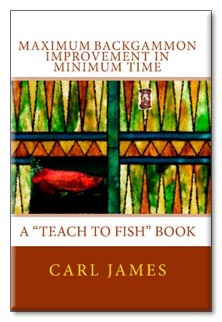 COVER: The goal of our "Teach to Fish" book series is not to merely write about a subject, but to teach a way of thinking. We want our readers to "learn to learn," so they can continue to improve after enjoying our books. In this book, we teach some good tenets of the great game of backgammon. What do winning backgammon players think about as games develop? Opening moves are reviewed, with strategy lessons in mind. The power of the doubling cube as a weapon is discussed. We want to maximize your backgammon game, in the minimum amount of time. Author Carl James enjoys using math and probability to describe events in the world. In particular, he loves to see what numbers can teach us about games like backgammon, sportsor the financial markets.